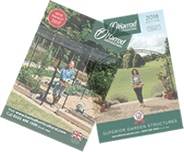 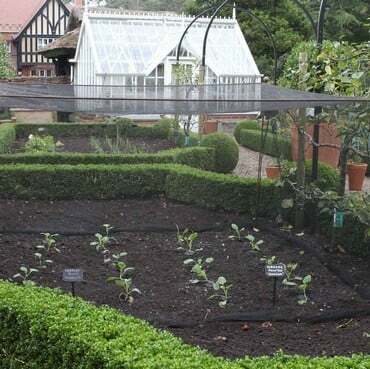 If you’re looking to bring a touch of sophistication and elegance to your garden this year then it’s well worth your time browsing through the NEW 2015 Ornamental & Kitchen Garden Structures brochure. 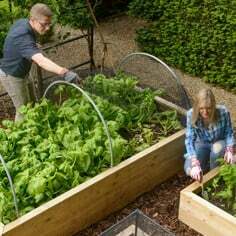 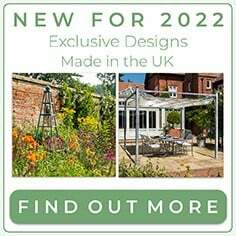 The updated award winning collection is brimming with more inspiration for traditional and contemporary gardens alike, whether they carry an ornamental or kitchen garden theme – all UK designed and manufactured. 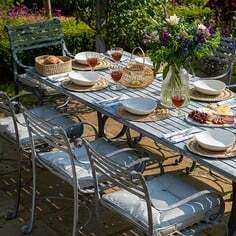 There’s the introduction of a NEW traditional vintage range of steel wire designs which bring charming old-world style and sculptural interest to any garden, particularly a cottage garden. 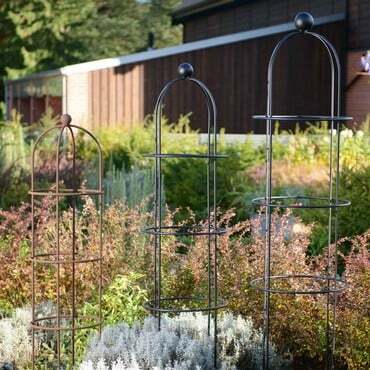 The handmade quality collection includes wire arches, cages, obelisks and plant supports that areavailable in a classic powder coated matt black or a natural rust patina finish, all with guarantees. 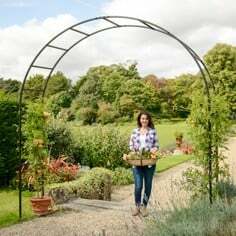 We take time to listen to our customers and due to high demand from respected garden designers we have introduced NEW contemporary powder coated colours into our box section Roman arch range. 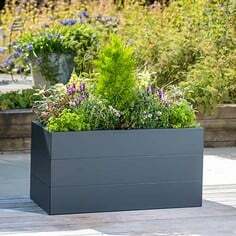 The Silk Grey and Lichen Green colours bring an alternative accent to the garden and work well with the landscape and plants. 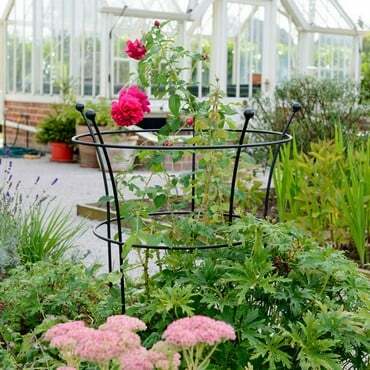 With statements in mind, our impressive Linked Arches and Pergolas are one for consideration, they create breathtaking floral walkways. 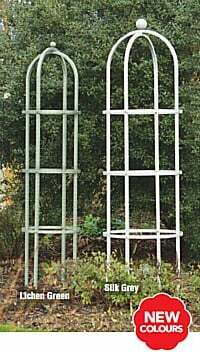 A stunning addition to compliment any border is our box section Harrod Steel Obelisks. 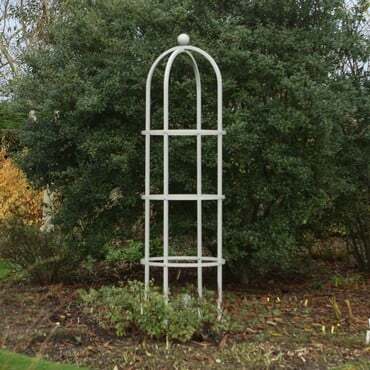 Available in 3 designs (Pyramid, Column and Square) they are now available in NEW powder coated colours (Silk Grey and Lichen Green), as well as traditional matt black. 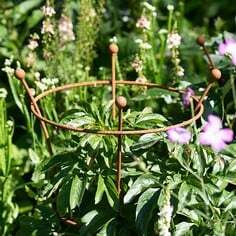 Another way of adding structure to your beds is by incorporating our NEW range of wire plant supports. 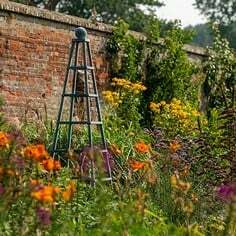 The three designs: Trumpet, Tall Circular and Short Circular are the perfect corsetry for showy heads and come in Powder Coated Matt Black or a Natural Rust finish.